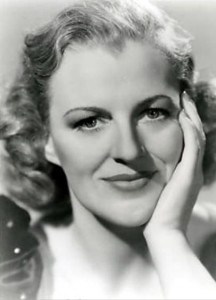 The English actress, singer and comedian Gracie Fields died on this day in 1979 at her home on Capri, the island on the south side of the Gulf of Naples. The 81-year-old former forces sweetheart had been in hospital following a bout of pneumonia but appeared to be regaining her health. The previous day she had walked with her husband, Boris, to the post office on the island to collect her mail. Some English newspapers reported that Gracie had died in the arms of her husband but that version of events was later corrected. It is now accepted that Boris had already left La Canzone del Mare, the singer's original Capri home overlooking the island's landmark Faraglioni rocks, to work on the central heating at a second property they had bought in Anacapri, on the opposite side of the island, and that Gracie was with her housekeeper, Irena, when she passed away suddenly. 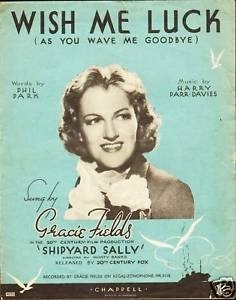 Fields, born Grace Stansfield in Rochdale, England, in 1898, had visited Capri for the first time in the late 1920s or early 30s, with two artists she had befriended in London, where she was becoming an established star in the revue format that was popular with theatregoers in the inter-war years. She would develop a romance with one of them, John Flanagan. They stayed in a former British fort overlooking Marina Piccola, named Il Fortino, and Fields was captivated, proclaiming that if she could ever own "one blade of grass" on the island she would be "the happiest woman alive." The opportunity arose more quickly than she anticipated when Il Fortino came up for sale in 1933 and she bought it, for £11,000. The only sadness was that Flanagan, with whom she lived in London, declined her offer to move to Capri with her, claiming he would have been too distracted to work. Nonetheless, she was not deterred from pursuing her dream. 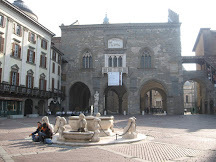 In 1935 she met Mario Bianchi, an actor from Cesena in northern Italy who had starred in a number of silent movies in the United States under the name of Monty Banks. Together they set about restoring Il Fortino and would eventually turn it into La Canzone del Mare, a restaurant and bathing complex that is still in business today as a luxury hotel. It was a life far removed from Rochdale, the mill town in Lancashire, where Fields was born above a fish and chip shop. However, the next few years were tough for Gracie. She made her first movie - Sally in Our Alley - in 1931 and in the next eight years starred in a dozen more. In 1939 came the devastating news that she had cervical cancer. She was given only a 50-50 chance of making a recovery but happily, after surviving a major operation, she was given the all-clear. Soon afterwards, she divorced her first husband, the theatre impresario Archie Pitt, her former manager, and in 1940 married Monty, who had been at her side throughout her illness. 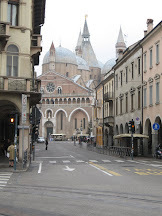 Marriage to an Italian led her into further problems, however. 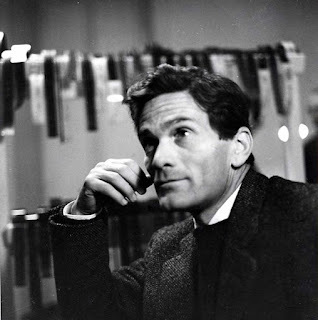 When Italy formed its alliance with Germany in the Second World War, Monty was classified as an alien and the couple were advised to move to America so that he could avoid internment in Britain. Their decision led to a backlash against Fields at home, with newspapers accusing her of abandoning her country. She rebuilt her reputation by performing at home and in Canada and the United States without pay, donating all the proceeds to the war effort. 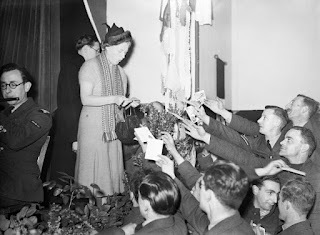 She also threw herself into entertaining British and Allied servicemen abroad, performing during air raids in France, behind enemy lines in Berlin, and travelling as far away as New Guinea and the South Pacific islands. She made her last movie in 1945 but continued her career, appearing regularly on television in both entertainment shows and drama. Away from the camerasm she spent much of her life on Capri. 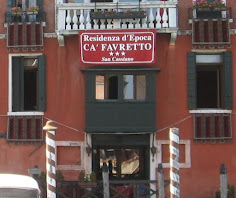 La Canzone del Mare, where she and Monty lived in a house above the restaurant, became a favoured haunt for Hollywood stars including Richard Burton, Elizabeth Taylor, Greta Garbo and Noël Coward. Opera singer Maria Callas and Jacqueline Kennedy Onassis are also said to have been visitors. After Monty Banks died in 1950, Fields was married for a third time, to a Romanian radio repairman called Boris Alperovici. 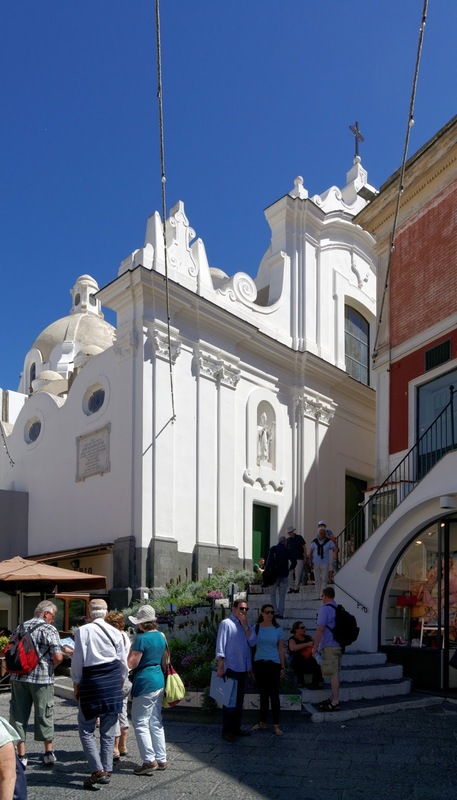 The ceremony took place at the Chiesa di Santo Stefano, the striking white church that overlooks the Piazzetta in Capri town. She made her last TV appearance in the United States in January 1979 and shortly afterwards, seven months before her death, was invested as a Dame by Queen Elizabeth II. She is buried in Capri's Protestant Cemetery. Capri has been a popular resort since Roman times and the remains exist of a number of Imperial Roman villas. Although its first known tourist was a French antiques dealer who visited in the 17th century, recording his impressions in diaries, it was not until the 1950s that the island began to attract visitors in anything like the numbers of today. 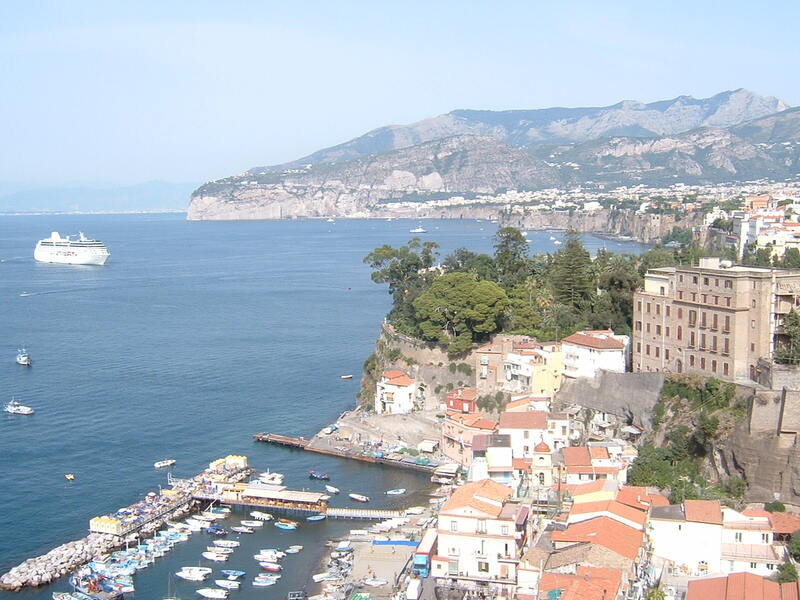 Tourists arrive at the island by ferry or hydrofoil from Naples, Sorrento, Positano, Amalfi and other ports around the Gulf of Naples. 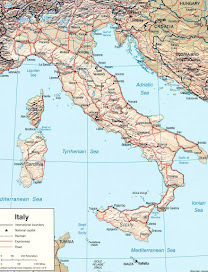 Attractions include the Blue Grotto, the picturesque Marina Piccola, the limestone Faraglioni sea stacks, and the towns of Capri and Anacapri. As well as being popular with tourists, Capri was for many years a favourite retreat for writers and can list Axel Munthe, Norman Douglas, Graham Greene, Curzio Malaparte, Mario Soldati and Alberto Moravia and Maxim Gorky as former residents. 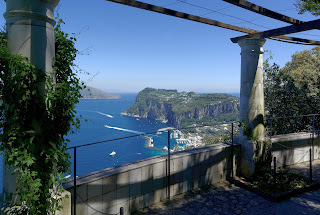 Greene spent at least two months of every year at his Villa Rosario in Anacapri, where the Villa San Michele, home to Axel Munthe, the Swedish physician and author, is open to the public and offers outstanding views.